Yesterday we had a look at a few different ways to recreate the popular leather wrap bracelet. Although the technique of winding beads between leather cords can be used with almost any shape or size you like, the most common style is a simple round bead or pearl. Today, I thought we could explore some of the beautiful possibilities of this classic bead shape in wrap bracelets. When I think of round beads, the first thing that comes to mind is Czech glass druks - their name literally means ‘round’. Of course there are so many varieties of materials that are carved, polished or pressed into perfectly spherical beads. Gemstones, shell and wood are just a few. 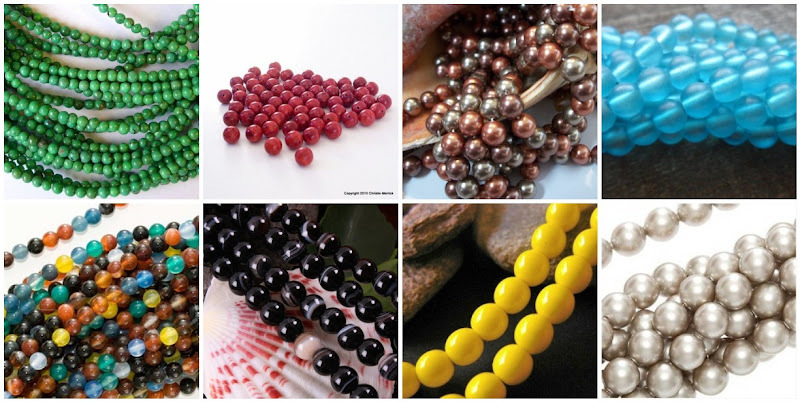 Nature provides us with only a handful of ready-made round beads, like rare saltwater pearls, and they have become classics in the world of jewelry and beads. 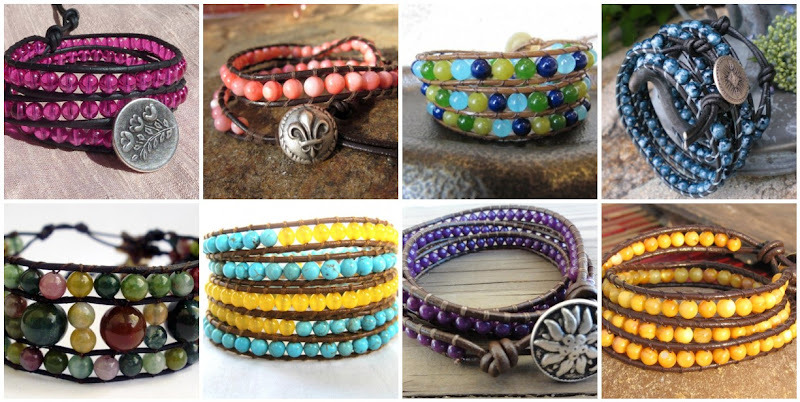 Here are some gorgeous examples of wrap bracelets made with small round beads. After Czech glass, semi-precious stones like agates and jasper are a popular material for these bracelets. When you need a lot of beads for a single project, lush but affordable strands are the most appealing. What kinds of round beads do you have in your stash? Which ones are your favorite? I love fancy jasper, bottom left in your photo examples, but my favorite at the moment is Inca Rose, because of its creaminess and ability to change color with the time of day and type of light. Recently, I've been using a lot of cream and copper colored glass pearls. <3 They add just the right amount of luster to neutral colored projects.